At The Foot Group we use state-of-the-art technology to analyse our clients’ individual biomechanics, in the form of a diagnostic treadmill. Under its belt is a matrix of over 7,000 calibrated sensors, which feed into a computer to show the distribution of pressure as a client walks barefoot on the treadmill. Graphically this is shown as colour contours as in the illustration above. 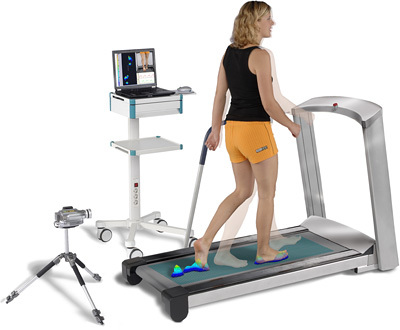 While the patient is on the treadmill a video camera is trained on their legs and feet, and this footage is synchronised with results from the treadmill sensors. Both are displayed onscreen in real time and are also recorded. During review, the recording can be slowed down or paused. The information can be compiled into a comprehensive full-colour report. Over several pages this illustrates important parameters used in gait analysis. These include the gait phases (one foot on the ground, the swing phase and both feet on the ground); step length; lines of the centres of pressure (COP) etc. This is stored electronically as a PDF. As well as being used barefoot, our treadmill can also measure the effect of shoes. A client can also simply stand on the treadmill while the sensors measure the distribution of pressure over their footprints, helping to evaluate their posture. This sophisticated system and its extensive reporting allows the most informed assessment of gait and posture available. According to the client’s reported symptoms, the information can be used to accurately diagnose the source of problems and to offer the most appropriate treatments.